Gas density is a crucial operating parameter for high-voltage switchgear. If the required gas density is not present, safe operation of the plant cannot be guaranteed. The gas density measuring instruments from WIKA warn reliably against dangerously low gas quantities, even under extreme environmental conditions. If the gas density drops as a result of a leakage, the switch contacts will switch. In addition to the traditional gas density monitor, with the model GDM-100-TI-D with Modbus® output, high-precision sensors and evaluation electronics are incorporated. 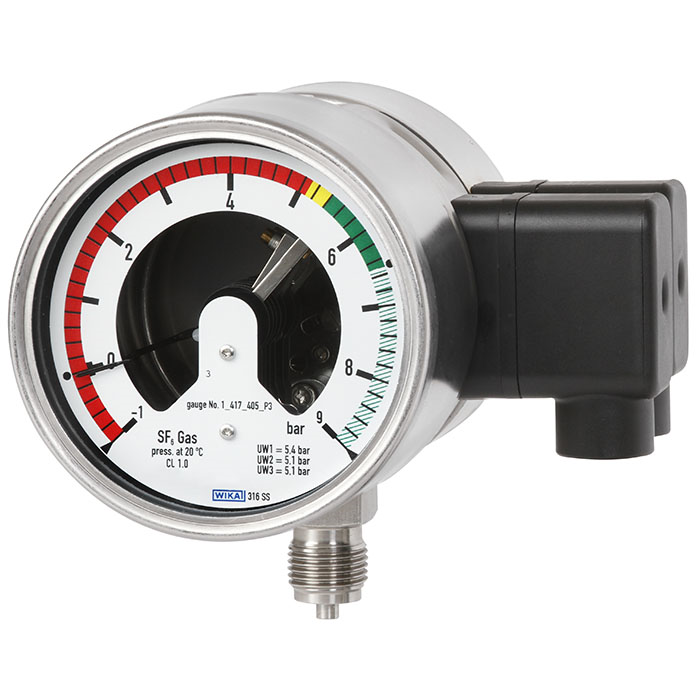 The GDM-100-TI-D only requires one connection to the measuring point to determine the pressure, temperature and gas density. Via the on-site display, the pressure related to 20 °C can be read directly on the instrument. With the integrated switch contacts, simple switching tasks can be realised quickly and without complication. The integrated Modbus® sensors enable remote monitoring of the plant. The measured data for pressure, temperature and gas density are transmitted using the standardised Modbus® RTU protocol. The advantages of this digital fieldbus are reduced cabling costs and very detailed measured data. The GDM-100-TI-D delivers continuous data packets to a local controller or a central control system with SCADA. There, the data packets can be saved and evaluated. The data storage enables trend analysis to be carried out, so that critical SF6 conditions can be predicted and rectified in time. An optimisation of the maintenance strategy from time-based (TBM) to condition-based (CBM) is possible through the use of the GDM-100-TI-D.